Text & Photographs By Terry Long © All rights reserved. Have you ever lost anything or, to be more politically correct, temporarily misplaced something? Or even worse, have you ever loaned money to someone and you forgot to who or how much? I have. In fact, I was told I lost my mind once or twice. And as far as money goes, if I got ten cents back for every nickel I loaned out and didn't get back because I forgot to who I loaned it to, I'd be rich! It's frustrating, isn't it? One thing I won't lose or misplace though are my slides. I've got thousands of slides tucked away in a file cabinet and can find any single one of them in a matter of seconds, OK, maybe minutes. Also, I've sent up to twenty slides to a magazine picture editor and didn't get them back for months. However, I knew exactly where they were at all times. If you shoot a lot of slide film there's a very simple way to keep track of things so you can retrieve a particular image(s) without pulling your hair out looking for it/them. Let me share with you my method. It's a proven method and has been around for awhile. In fact, I got my idea from Mr. John Shaw, a world renowned natural history photographer. I've changed his method to suit my needs but it's still pretty close to what he does, and it's pretty foolproof. If you want to get an in-depth and detailed explanation on how to do this, skip this article and get Mr. Shaw's book "Business of Nature Photography" by Am Photo Books. I got my copy from Amazon.com and it's proved itself to be an invaluable asset to me on several occasions. I use it as a reference tool all the time. The first things you're going to need are some slides. If you don't shoot a lot of slide film or you don't anticipate making money on your slides, this reading probably isn't necessary. But, if you're constantly sending your slides to picture editors, card or calendar companies, you should get organized to the point where you can store, retrieve, track, etc., your slides very easily. Storing them isn't much of a problem and I recommend you get some slide storage pages from a photography store. Usually, the pages will hold up to twenty slides per page and they're either made to be stored in a file folder or can be hung directly in a file drawer. 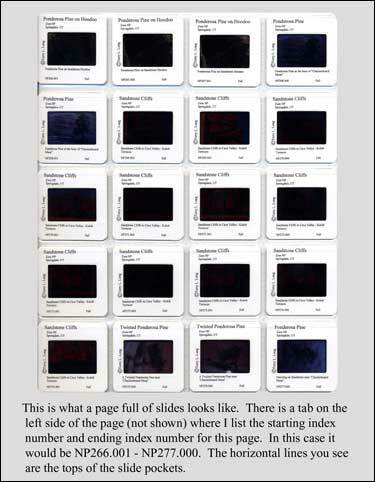 Also, each page can be placed on a light box where you can view all twenty slides without having to remove each slide from its protective pocket. The pages come in a pack of 25 to 50 and cost somewhere around $10.00 for a pack of fifty. Next, you'll need some sort of a database where you can store all of the information you'll need for identifying the slides. 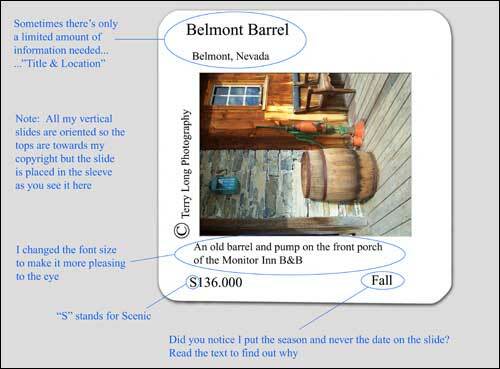 If the database is good enough, you'll be able to print slide labels, search for a particular slide or slides, and prepare tracking documentation of each slide you have out. Microsoft Works has a database that would work and their Access program is surely powerful enough to do everything you'd need or want. There are also ready-made programs out there specific to slide film tracking but they can be costly. I've seen programs that'll run up to $700, $800, and even $900! GADZOOKS! I happen to own one of those ready-made out of the box programs. It's called Slide Scribe and is marketed by ELLENCO out of Tijeras, NM. Do a Goodle search and I'm sure you'll find them. If I remember correctly, it cost me about $150. They also have the slide labels you print the data on and then stick to the slide. The next things you'll need are a computer and printer, obviously. I won't get into brands but I highly recommend you use an ink-jet or laser printer for your labels. You can get by with a dot-matrix printer but the quality of the type will be much better with an ink-jet or laser printer. Also, with a dot-matrix, you'll be limited with the fonts and font sizes you'll want to use. Remember, you're sending your slides out to a picture editor and you want to give that professional appearance. OK, let's back up to the program. As I mentioned, I use Slide Scribe. It didn't cost me a whole bunch of money and it does absolutely everything I need or want it to do. There are a few very minor flaws with it but, nothing I haven't overcome with a little practice and experience. To get going, I had to create a database but, it wasn't very hard to do and took only about forty-five minutes to start storing the information I needed. On a blank piece of paper I drew an outline of a slide. Then, I put the information I thought I'd need on the cardboard portion of the slide. Off to the side of my drawing I put other information of what I thought I'd need for cross-referencing my slides but wouldn't be included on the labels. Then, in the program I created the fields for the information, both for what was going to print on the labels and my cross-reference information that would not be printed. 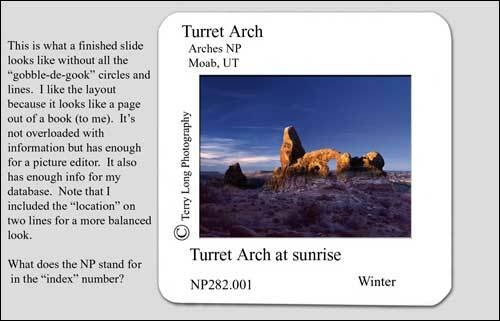 Some of the fields I use for printing are Title of the slide, Sub-Title, Location of the slide, Description of the slide, File Number, Season, and my Copyright. Depending on what the image is and what category it's in, I'll either have more or less information on the label. Scenics don't need a Scientific Name, so I don't include it in my database for scenics. But, my Mammal and Flowering databases need Scientific Name. More on that in a few minutes. As you can see on the first slide, I've got all the basic information needed for a picture editor to use. The cross reference information you don't see are Desert, Sunrise, California, Provia (the type of film I used on this shot), Horizontal, etc. Let's say a picture editor wanted a picture of a Desert Sunrise and wanted the format to be Horizontal. That'd take a lot of looking. But, all I'd have to do is do a query in my database and in a matter of seconds this particular slide (information) would pop-up with a dozen or so more. Then, because I've got the File numbers listed in the database, all I'd have to do is look for those numbers in my file drawer. Because the slides are stored in the plastic pages (numerically), I'd look for the numbers, place the pages on my light box, and choose the best one(s) the editor would probably want. SEE HOW EASY THAT WAS? Aren't I smart? Just kidding, remember, I just changed Mr. Shaw's method so, I can't take all the credit. Do you see anything wrong with the information provided in the Location? If you can't tell, I'm not going to let you in my mistake but, I've since change the label so it's correct. 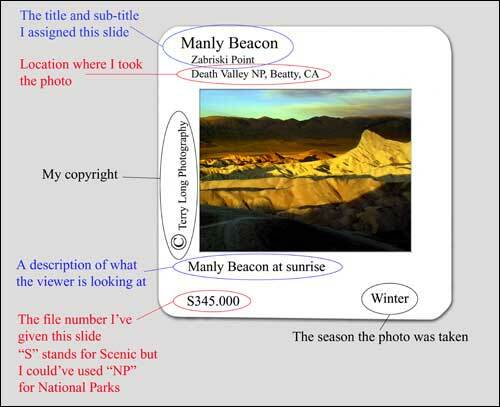 Take a look at the first example titled Manly Beacon. In the lower left corner is the file number S345.000. The S stands for Scenic and it's the 345th image in the scenic file folder(s). I'll explain what the other three digits are for in a little bit. So, in my query, when the twelve or so numbers popped up, S345.000 was one of them. The pictures of the others included vertical shots or were the wrong time of day so, number S345.000 was the one. By the way, I could've put this under the category of NP (National Parks) but for some reason I listed it as a scenic instead. Don't ask me why, as I stated earlier, someone said I lost my mind! But take a look at the Location line on the slide. It says Death Valley NP, Beatty, CA. With that information I'd probably look in my National Parks database to see if anything else comes up that fits the parameters of the picture editors want list. Nifty, huh? Let's look at another slide under a different database category, Mammals. You'll notice I've substituted the Sub-Title with Scientific Name. The reason I did this is to show everyone how smart I am. Sheesh, how arrogant! Not really. It's because if a magazine asked for a picture of a Canis Lupus, I'd have it. Notice the file number M244.001. M stands for, you guessed it, Mammals and it's the 244th second picture. What I mean by second picture is it's an exact copy of another picture or, simply put, a duplicate. To be honest with you, it's not an exact copy but a bracketed shot. With slides I always bracket to be sure I get it right. Usually, two of the shots are pretty darned close in exposure so I'll keep those two. The other one ends up in the trash. So, M244.000 is the first slide and M244.001 is the second slide. If there were a third slide of the same picture it'd be labeled M244.002. I rarely have a .002 picture though. By the way, a picture editor doesn't need all that information and it's probably a good idea not to volunteer that stuff either. The rest of the information is pretty much boilerplate. Oh, always let the viewer know what they're looking at. 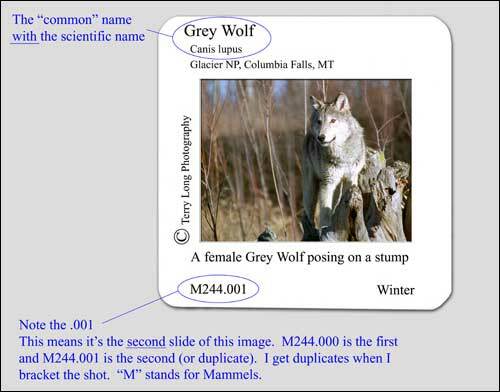 In this case, the Description is A Female Grey Wolf posing on a stump. Another slide similar to Mammals would be Flowering Plants. 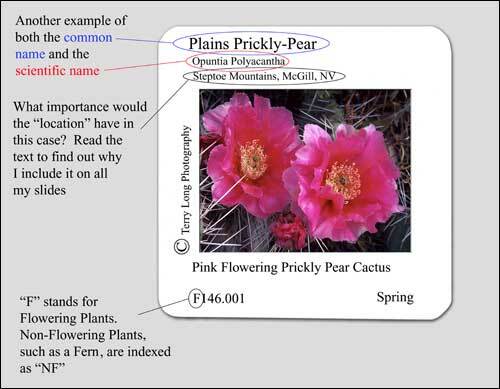 As you can see, it's got the same information as the Mammals picture but it's of a Flowering Plant. Course, the file number begins with the index letter F and it has an entirely different number. And of course, it's in a database all its own, Flowering Plants. The reason I put Locations on all my slides is because of picture editors. If an editor asked for pictures of Wild Flowers in the Steptoe Mountains, Eastern Nevada Mountains, Great Basin Desert, or even McGill, Nevada, I'd have all the bases covered with a quick query (say that three times fast). One of the non-printing fields in my database is color. In this case the color would be pink. So, if the editor wanted pictures of red or pink flowers I'm covered there too. Am I amazing, or WHAT? And to think, I didn't do all that well in school! Onward and upward! Let's take a gander at another slide, Scenics. I don't want to overload the label with too much, especially with unnecessary information. All the basics are there, Barrel, Pump, Belmont Nevada, B&B (Bed and Breakfast), etc. so, a query would work here. So, just the Title and Location are needed on the top portion of this scenic shot. As you can see, in the description portion of the label I changed the font size. The sentence was too crowded in a larger font so I made it smaller to keep it aesthetically pleasing to the eye. Also, as mentioned in the side text of the graphic, I keep all my verticals oriented so the top is at the copyright side of the label. There's no reason I do this other than being consistent. One thing you should know about submitting slides for review, if the image is selected for print, they're going to remove it from the cardboard sleeve and, when they're finished, they'll put it back in so the slide won't be damaged during transport. However, they might not put it back in oriented the same way you sent it and the cardboard sleeve will probably be damaged. So, have a few empty cardboard sleeves handy for remounting. You'll also have to make another label for the new sleeve. If you noticed, on all my examples I've omitted the date and substituted it with the Season. The reason is pretty simple and reasonable after you read my explanation. About three years ago, an editor asked me to send in a couple of Fall Color shots showing the variety of foliage in Eastern Nevada during autumn. I didn't have anything from that year, yet, so I sent in some older shots (nothing more than two years old though). I used to have the dates in the same place I now have the season located. They were all rejected because she wanted new colors and not old colors. Now, I don't know about anywhere else, but here in Eastern Nevada, last years fall colors look pretty well much the same as this years fall colors. So in reality, she was looking at the date and not the picture. That's how picky picture editors can be. So, unless you're not going to submit you images for sale or publication, I recommend you leave the date off and substitute it with the season. Or you can put the date in a non-printing field. And finally, a slide without all the little circles and lines, to show-off my prowess with Adobe Photoshop, as it appears in my slide page. Hang in there, you're almost done! Now that I've got all my slides labeled how I want them to be, I have to store them in the plastic pages I mentioned earlier. The pages I use are top loading but, you can also get the side loading ones too. There's no price difference between the two. I just selected the top loading. Each page'll hold twenty slides, four across and five down (I figured that out without using my fingers or toes). I load the page from the top left to the bottom right with each row beginning at the left side. It stands to reason that each slide is placed in the page numerically. Also, I only put Fall Colors on one page, and continue until I'm finished with all my Fall Colors. Then it's off to Mammals, Scenics, National Parks, and so on. Each Fall Color page is placed in a hanging file with other Fall Colors. And so on with the other categories. The pages I use are meant to be stored in a binder so, there's a tab on the extreme left side of the page with three holes for the binder rings. On that tab I put the beginning file number and ending file number of the page. This helps speeding up in locating the specific file numbers of the slides. Here's an example of the page once it's filled. You can't see the tab on the left but, it's there. Each file folder will hold about five or six full pages so I just insert another folder and fill that one up and then on to the next. After awhile I found out I needed a four drawer file to hold all my existing slides but, I'm starting to get the drawers filled up again so I'm looking for another file cabinet (do you know how expensive they can get!). Well, that's it in a nutshell. This system works great for me and if you decide to go this route for storing your slides, you can tailor it to fit your needs. A small note for 35mm print film guru's. This system would work for you too but, you'd have to stick the labels on the file page instead of the film (duh). Also, you'd have to cut your strips to individual frames but, most labs don't like that and prefer the film remained in strips of four to six frames per strip. However, if you're going to have an image drum scanned, they'd prefer the frame to be individual so, my method would work. If you decide you're going to get your slides in order for publication or sale, I highly recommend John Shaw's book I mentioned earlier. It's got a lot more information than what I provided and explains much more in detail. For you computer geeks out there who can manipulate a database faster than most people can walk across the street, I'd just use a good existing database program, otherwise, for people like me who have a hard time finding the on-off switch to the computer, I recommend a program like the one I use. What a life-saver it's proved to be for me. Since I've started using this method, I've never lost or temporarily misplaced a single slide. I've always known where each and every slide was when it was out. Now, if I could only find my glasses!